We are cross-posting this invitation to our Homes By SMS readers because as an affiliate of Janie Coffey’s 12-Week Luxury Real Estate Training Course, we wanted to make sure that you are aware of the Early Bird Special available until November 10. One of her students in the previous course that ended in October, listed a $3 million property as a newly license agent, all based on the course’s material. Janie’s new course starts on December 1, 2017 and if you wanted to learn the ins and outs of luxury real estate, this course is for you. Over 130 agents and brokers attended her previous course from all over the country to learn how to gain access to local real estate markets, how to use expireds to win luxury listings, how to market those effectively, how to grow operations while managing cost and financials as a luxury agent and many, many other topics specific to high end real estate sales. 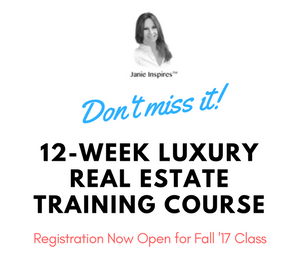 Janie’s next 12-Week Luxury Real Estate Training Course is just around the corner: Sign up to the next class before registration closes in a few weeks. Janie’s training course comes with an amazing money back guarantee policy. If for whatever reasons you are not satisfied with what you learned during the course, the fees are fully refundable until the very last day of the 12-week training course. With her 100% Happiness Guarantee, there is absolutely no risk in signing up today. Get started now before registration closes in a few weeks. Full disclosure: We are an affiliate of Janie Coffey’s training program and we financially benefit if you sign up with her services via our links. Copyright © 2017 RealBird Inc. All Rights Reserved.